Many different industries rely on precision machining specialists to provide them with services such as CNC machining and other custom machining services. Metalwork for the automotive, solar, electronics and other manufacturing industries is an essential part of the production process. Other sectors, such as aerospace, medical, and biotechnology, rely on highly customized services for machining precision components according to exact specifications. Our Massachusetts precision machining is used by clients for construction, manufacturing, and production across many different industries. At AMI Machining, our success is a result of our ability to deliver rapid response prototyping and consistently high-quality production runs designed to meet or exceed our customer’s expectations. We are proud of our company and the loyal customers who have helped us along the way. Our shop is filled with state-of-the-art equipment, and we utilize the industry’s best practices to ensure on-time delivery and superior quality for all of the products we manufacture. It is our creativity and commitment to excellence that separates AMI Machining from the competition. When you outsource your custom machining services to AMI Machining, you can reduce costs for overhead on the production of your precision components. 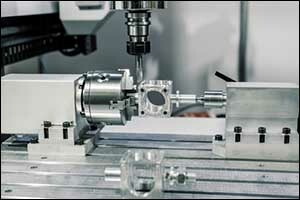 The cost to provide CNC machining in-house could put your project over-budget. Operating expenses for skilled labor and quality equipment can be high in a competitive market, especially for one-off, short-term, or prototype projects. Outsourcing through our precision machine shop can be a great way to get high-quality results without having to purchase equipment, recruit skilled workers or train existing staff. Outsourcing your custom machining services with a team of precision machining specialists means having your project worked on right away, reducing lead times associated with having to learn a new skill or determine the best course of action. An experienced precision machine shop will know exactly what is needed to get the job done. You won’t have to chase down materials, software, or lease machinery just to create a prototype. Don’t waste your time trying to do it yourself. Hire AMI Machining for Massachusetts precision machining so you can take your business to the next level without any unnecessary delays. Our team of technicians is highly trained and experienced. We are a one-stop machining and assembly shop, providing top quality custom machining services to clients throughout New England and all around the globe. Our skilled and knowledgeable production staff can assist with custom manufacturing solutions, offer early design involvement to reduce manufacturing costs, and ensure lean manufacturing for continuous process improvement. A team of engineers and technicians work together on each project to provide the best possible results for our customers. Not only will you save by not having to purchase equipment to do your custom machining services in-house, but you will also be able to take advantage of our state-of-the-art equipment, which is used in our climate controlled facility. We take pride in the services that we provide to our customers, and we ensure that our team is regularly trained, certified, and gain experience in the latest techniques, technology, and industry advances. Located in Middleboro, Massachusetts, our equipment is highly advanced and designed to be used for custom manufacturing by our precision machining specialists. AMI Machining is proud to have earned our ISO 9001 certification. We are also ITAR registered and veteran owned, providing everything that we do in-house at our one-stop precision machine shop. We deliver 100 percent verification at each production interval and continuous in-process inspection to ensure quality results. We are committed to using regularly calibrated measuring equipment and statistical process control (SPC) for even more quality control throughout production. We use a wide range of quality control machines, including Coordinate Measuring Machines (CMM) to provide precise measurements with computer-aided accuracy for the very best results in quality machining and manufacturing. If you are interested in learning more about our engineers, technicians, or equipment at our precision machine shop, give us a call at 508-947-1192. We can answer any questions that you might have about our custom machining services or provide you with a FREE estimate for your next project. Our team of precision machining specialists can help you achieve your goals at our one-stop precision machine shop. Call today for quality Massachusetts precision machining for all of your industry needs.